I actually filmed today’s lumiappadahy about two hours before I hit the airport for Barcelona so as you might guess it is travel related. Its called FlightAware and it’s a flight watcher/tracker app that keeps you updated with the latest arrivals, departures,cancellations and delays for all currently scheduled and airborne flight; with FlightAware you can track flights by their flight ID number, tail number (according to my Hardy Brothers info that’s mostly for private/chartered flights no?) and by the planes Route. FlightAware also enables you to view live currently airborne flights around you location (displayed on Bing maps) as well as any other location you choose. If you choose to make an account (still free I think) you can get alerts on your phone about flights you’ve decided to ‘watch’ in-case they’ve been delayed or re-scheduled; or you can choose to check out which airports are experiencing delays due to weather conditions or unexpected air traffic; over all FlightAware is a really cool app, even if you’re not planning on going anywhere soon; useful even if you’re just going to pick up a buddy from the airport or dropping off your mother in-law and don want to have the ‘pleasant surprise’ of knowing she’ll be staying an extra week due to a missed flight- get it free at the marketplace. 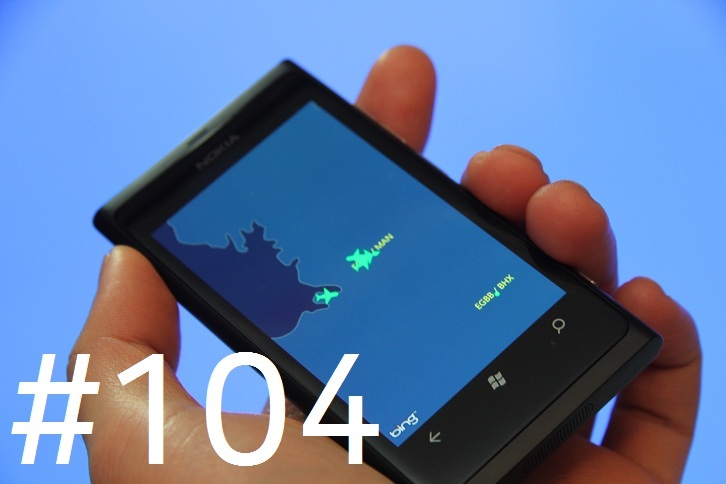 Free, live flight tracking from FlightAware for Windows Phone 7! This app allows you to track the real-time flight status for airline flights worldwide and private flights in the US and Canada. Search by aircraft registration, route, airline flight number, city pair, or airport code.Tracking data includes complete flight details and full-screen maps with NEXRAD radar overlay.